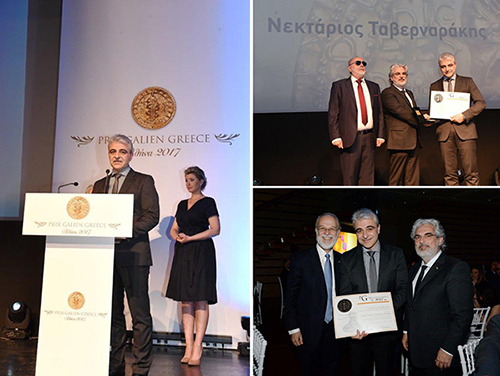 Nektarios Tavernarakis, the Chairman of the Board of Directors at the Foundation for Research and Technology-Hellas (FORTH), and Professor at the Medical School of the University of Crete was awarded the Galien Scientific Research Awardat a ceremony that took place on April 1st, under the auspices of the President of the Hellenic Republic Mr. Prokopios Pavlopoulos,at Megaron, the Athens Concert Hall. This prestigious Prize is awarded every two years, to Greek scientists who have made substantial, ground-breaking contributions to the development of innovative ideas, products or methods for the diagnosis or treatment of disease. In addition to the golden Prix Galien medal, the winner also receives an honorary award of 10,000 €. By awardingthese prizes, theGalien Foundation aims to reinforce the creative work of scientists, to reward their continuous and consistent efforts, to honour their national stature and to contribute to the creation of new standards in the community. Nektarios Tavernarakis was selected to receive the award for his seminal research achievements, relevant to ageing, neurodegeneration, and learning and memory. Nektarios Tavernarakis is the Chairman of the Board of Directors at the Foundation for Research and Technology-Hellas (FORTH), Research Director at the Institute of Molecular Biology and Biotechnology (IMBB), and Professor of Molecular Systems Biology at the Medical School of the University of Crete, in Heraklion, Greece. He is the Director of the Graduate Program on BioInformatics at the Medical School of the University of Crete, and is also heading the Neurogenetics and Ageing laboratory of IMBB. He is an elected member of the Scientific Council of the European Research Council (ERC), the European Molecular Biology Organization (EMBO), and Academia Europaea. He has also served as the Director of the Institute of Molecular Biology and Biotechnology. He earned his Ph.D. degree at the University of Crete, and trained as a postdoctoral researcher at Rutgers University in New Jersey, USA. His research focuses on the molecular mechanisms of necrotic cell death and neurodegeneration, the interplay between cellular metabolism and ageing, the mechanisms of sensory transduction and integration by the nervous system, and the development of novel genetic tools for biomedical research. For his scientific accomplishments, he has received several notable scientific prizes, including an innovation-supporting ERC Proof of Concept Grant and two ERC Advanced Investigator Grants. He is one of the first in Europe, and until now the only one in Greece, to have been awarded this highly competitive and prestigious grant twice. He is also the recipient of the EMBO Young Investigator award, the Alexander von Humboldt Foundation, Friedrich Wilhelm Bessel research award, the Bodossaki Foundation Scientific Prize for Medicine and Biology, the Empeirikeion Foundation Academic Excellence Prize, the Research Excellence award of the Foundation for Research and Technology-Hellas, the BioMedical Research Award of the Academy of Athens, and the International Human Frontier in Science Program Organization (HFSPO) long-term Postdoctoral Fellowship.